With allegations related to sexual harassment against two of its members still pending, House Speaker J.D. Mesnard opened the 2018 legislative session with a call to all -- especially the men -- to do better. 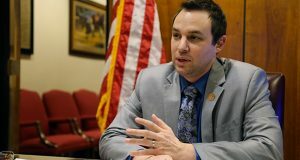 The Arizona House Republican caucus met today to select the chamber’s next majority leadership team, and as expected, the caucus selected Rep. J.D. Mesnard to run the chamber.